This is Yamaha's smallest instrument. Its 21" (535mm) scale length and 3-3/4" (94-100mm) deep body provide a perfect fit for the beginning musicians. 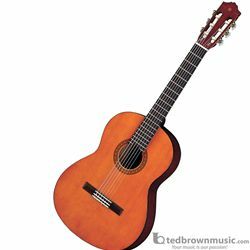 This petite size is the most difficult to produce properly, and many inexpensive student guitars fill this range. But don't let them fool you. The CGS102 is a legitimate musical instrument, constructed with the beautiful tonal woods and meticulous details of a full-sized Yamaha guitar.